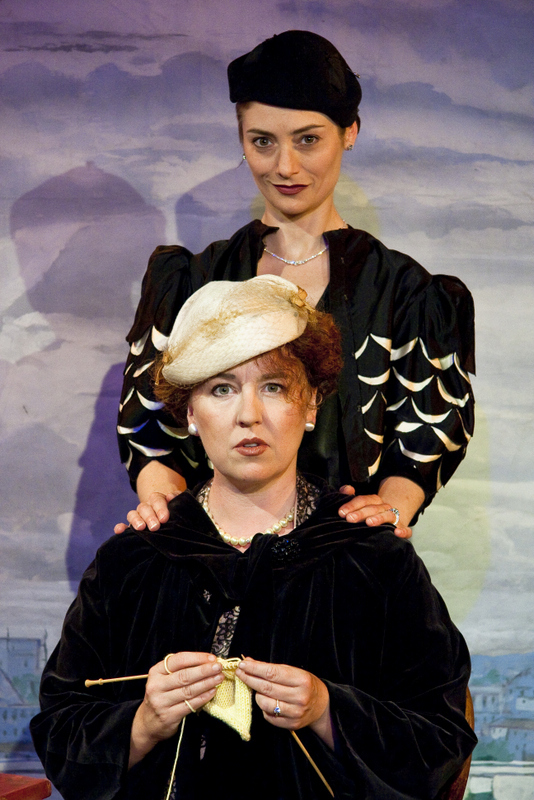 Roman Fever – Bewley’s Cafe Theatre – Review by Frank L.
Two New York dames from the upper crust are sitting on the terrace of a restaurant looking out on the eternal city as they reminisce about their time together in their early twenties when they last visited. They both now have daughters who are of a similar ages as they were. Alida Slade (Maria Tecce) is the more striking of the two, magnificently dressed by Peter O’Brien in a black dress with an elegant black hat bedecked with a large diamond brooch and smart hat pin. Grace Ansley (Karen Ardiff) is attired in a more homely fashion and to the surprise of Alida produces her knitting out of her capacious handbag. As they discuss the past, their husbands and their daughters, it becomes clear that there is a very competitive edge to their long standing friendship. Alida is not slow to point out her more successful life but Grace, like a good tortoise with the hare, bides her time. It is beautifully paced and Tecce and Ardiff are perfect foils for each other. The enjoyment of the piece is further enhanced by Jack Kirwan’s Roman landscape which forms the backdrop to the stage. Another touch which adds to the pleasure is that the waiter is a real live Italian, Fabiano Roggio, who circulates amongst the audience before the performance begins, then from the stage makes the house announcements in Italian and English before taking his place on the stage. The entire effect was to create the atmosphere of being in the same Roman restaurant as the two New York dames and that one was eavesdropping on their conversation. The play lasts only forty five minutes but its brevity is not a problem as the plot and text are excellent and the whole stylish production is a visual delight.